It is hard to imagine the existence of Chicago or even this country’s industrial revolution without the Chicago River. The State of Illinois’s 1887 decision to reverse the flow of water from the Great Lakes to the Mississippi River made it possible to move goods through the city and eventually down to the Gulf of Mexico. The river has always had a mythic, if slightly detached, relationship to Chicago until the last few years. But a recent effort has transformed the river and its constructed banks into a major public space for the city, particularly its downtown Loop. No architect has been more responsible for this transformation than Carol Ross Barney. 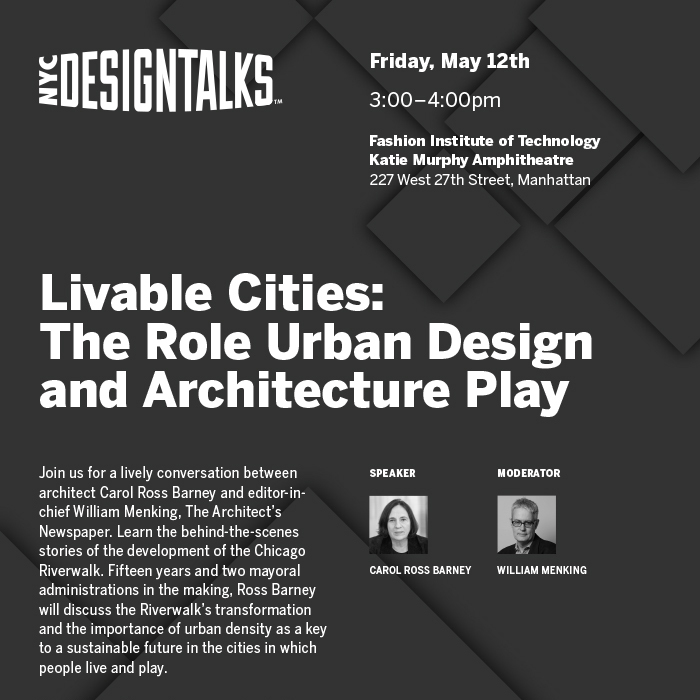 I will be interviewing Barney about her important work transforming the riverside banks into a ‘Riverwalk’ this Friday, May 12th for NYCxDesign’s NYC Design Talks. The Q&A—which is free and open to the public—will take place at the Fashion Institute of Technology’s Katie Murphy Amphitheater from 3:00 to 4:00pm. See the event’s webpage here for more details.